Her Dad Bet She Won't Hit the Highest Note, But What She Did is Even More Phenomenal! Her Dad Bet She Won’t Hit the Highest Note, But What She Did is Even More Phenomenal! You’d want to hear her sing over and over again. I can’t believe that “The Star Spangled Banner” would play in like an earworm in my head. That’s how great 11-year old Lexi Walker’s voice is. 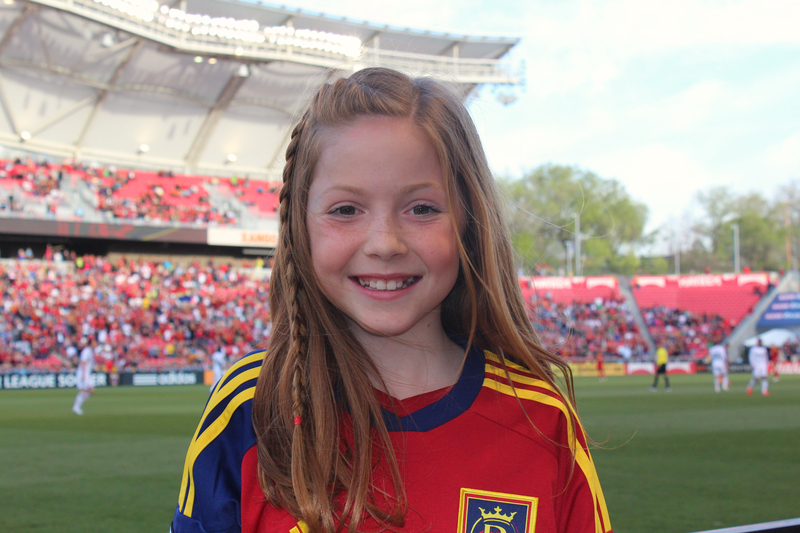 This pretty, little 7th grader from Cottonwood Heights, Utah sang the National Anthem at the Real Salt Lake Soccer game like she was auditioning for American Idol or The Voice. Her angelic voice matched her looks, but her rendition is so powerful and dynamic that she already sounded like a pro! The crowd cheered in awe of her vocal prowess, which also ignited the crowd’s passion and excitement for the game. Before her performance, Lexi’s dad teased her into a wager. Her dad bet that she won’t be able to hit the highest note in the anthem. Guess what? Lexi won. And not only that, this little girl even raised the note like an octave higher! It’s amazing to see Lexi and hear her sing because despite the range of the song, she sang it effortlessly. Her electrifying voice paved the way for her next stints and TV guestings. She was invited to sing the National Anthem again, but this time at the NFL and NBA games. She also appeared at America’s Got Talent, The Queen Latifah show, and Good Morning America. Her cover of the song “Let It Go” has received almost 55 million hits on YouTube. With Lexi Walker’s talent, she surely has a bright future in the music industry. What can you say about Lexi’s voice? Share your thoughts in the comment section below. Here’s How Your Favorite “GOT” Characters Look Like in the Book Versus on TV. We’re wondering what happened to Tyrion Lannister’s nose? With the epic comeback of “Game of Thrones”, thronies all over the world can’t seem to get enough of their favourite characters in the award-winning HBO series. Ever wonder how your favorite GOT characters look like as envisioned by George R.R. Martin in his books? One fanatic of the fantasy saga took time to create portraits of the characters based on the detailed description written by Martin in his best-selling novels. HBO did a pretty good job since some of the cast members of the epic series are pretty much doppelgängers of their fictional counterpart. Still, some look completely different. Nevertheless, we think the actors in the critically-acclaimed series nailed their characters. Pregnant Belly Dancer Captivates the Audience With Her Mesmerizing Moves! There’s something about belly dancing that captures the attention of the viewers, taking us straight into the stories of the Arabian Nights, of Princess Jasmine and her handsome Aladdin. So, when belly dancer Sadie Marquardt performed the exotic dance on stage, she truly captivated her audience. But what’s even more incredible with this performance is that Sadie is pregnant! Considering that belly dancing is a celebration of femininity and pregnancy is the ultimate woman’s joy, this dance was rather symbolic. This super slim model has stretch marks – and not afraid to show them! Celebrities are known for hiding their flaws as much as possible, showing only their best, most beautiful photos for their fans to see. They rarely admit to having their photos edited or to undergoing cosmetic surgery, of course, but keened-eyed fans and the paparazzi know better.